This posting is a an addendum to Roberto's and Andrew's postings rebutting the Ugly Voice's clip no. 5 [YouTube version], which concerns the Nuremberg trial. Samuel Rajzman        | 15 min. Rudolf Hoess          | 3 1/2 min. Yankel Wiernik        | 1 1/2 min. Belzec Electric Floor | 30 sec. 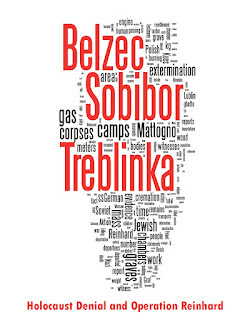 Sobibor 2 sentences:  | 30 sec. Q. How did you come on to the track of mass killings? You have just spoken of individual killings. A. I found traces of mass killings also by accident. At the end of 1943, I discovered two trails at the same time, one leading to Lublin and the other to Auschwitz. Q. Please describe the Lublin trail first. A. One day I received a report from the Commandant of the Security Police in Lublin. He reported that in a Jewish labour camp in his district a Jewish wedding had taken place. There had been 1,100 invited guests at this wedding. As I said, 1,100 guests participated in this Jewish wedding. What followed was described as quite extraordinary owing to the gluttonous consumption of food and alcoholic drinks. With these Jews were members of the camp guard, that is to say some SS men or other, who took part in this function. This report only came into my hands in a roundabout way, some months later, as the Commandant of the Security Police suspected that the circumstances indicated that some criminal acts had occurred. This was my impression as well, and I thought that this report would give me an indication of another big case of criminal corruption. With this intention, I went to Lublin and I went to the Security Police there, but all they would tell me was that the events were supposed to have happened at a camp of the "Deutsche Ausrustungswerke." But nothing was known there. I was told it might possibly be a rather peculiar and "opaque" (this was the actual term used) camp in the vicinity of Lublin. I found out the camp and the commandant, who was Kriminalkommissar Wirth. I asked Wirth whether this report was true and what it meant. To my great astonishment, Wirth admitted it. I asked him why he permitted members of his command to do such things and Wirth then revealed to me that on the Fuehrer's order he had to carry out the extermination of Jews. Q. Please go on, witness, with what you did. A. I asked Wirth what this had to do with the Jewish wedding. Then, Wirth described the method by which he carried out the extermination of Jews and he said something like this: "One has to fight the Jews with their own weapons, and one has to cheat them." Wirth built up an enormous deceptive manoeuvre. He first selected Jews who would, he thought, serve as column leaders, then these Jews brought along other Jews, who worked under them. With those smaller or medium-sized detachments of Jews, he began to build up the extermination camps. He extended this staff, and with them, Wirth himself carried out the extermination. Wirth said that he had four extermination camps, and that about 5,000 Jews were working at the extermination of Jews and the seizure of Jewish property. In order to win Jews for this business of extermination and plundering of their brethren of race and creed, Wirth gave them every freedom and, so to speak, gave them a financial interest in the spoliation of the dead victims. As a result of this attitude, this extraordinary Jewish wedding had come about. Then I asked Wirth how he killed Jews with these Jewish agents of his. Wirth described the whole procedure that went off like a film every time. The extermination camps were in the East of the Government General, in big forests or uninhabited waste lands. They were built up like a Potemkin village. The people arriving there had the impression of entering a city or a township. The train drove into what looked like a railroad station. The escorts and the train personnel then left the area. Then the cars were opened and the Jews got out. They were surrounded by these Jewish labour detachments, and Kriminalkommissar Wirth or one of his representatives made a speech. He said: "Jews, you were brought here to be resettled, but before we organize this future Jewish State, you must of course learn how to work. You must learn a new occupation. You will be taught that here. Our routine here is, first, everyone must take off his clothes so that your clothing can be disinfected and you can have a bath so that no epidemics will be brought into the camp." After he had found such calming words for his victims, they started on the road to death. Men and women were separated. At the first place, one had to give his hat; at the next one, his coat, collar, shirt, down to his shoes and socks. These places were set up like check-rooms, and the person was given a check at each one so that the people believed that they would get their things back. The other Jews had to receive the things and hurry up the new arrivals so that they would not have time to think. The whole thing was like an assembly line. At the last stop they reached a big room, and were told that this was the bath. When the last one was in, the doors were shut and the gas was let into the room. As soon as death taken place in, the ventilators were started. When the air coup be breathed again, the doors were opened, and the Jewish workers removed the bodies. By means of a special process which Wirth had invented, they were burned in the open air without the use of fuel. Q. Was Wirth a member of the SS? A. No, he was a Kriminalkommissar in Stuttgart. Q. Did you ask Wirth how he arrived at this devilish system? A. When Wirth took over the extermination of the Jews, he was already specialist in mass destruction of human beings. He had previously carried out the task of getting rid of the incurably insane. On behalf of the Fuehrer himself, whose order was transmitted through the Chancellery of the Fuehrer, he had, the beginning of the war, set up a detachment for this purpose, probably composed of a few officials of his, I believe, the remainder being agents and spies of the criminal police. Wirth very vividly described how he went about carrying out this assignment. He received no aid, no instructions, but had to do it all by himself. He was only given an old, empty institution in Brandenburg. There he undertook his first experiments. After much consideration and many individual experiments, he evolved his later system, and then this system was used on a large scale to exterminate the insane. A commission of doctors previously investigated the files, and those insane who were considered to be incurable were put on a separate list. Then the institution one day was told to send these patients to another institution. From this institution the patient was transferred again, often more than once. Finally he came to Wirth's institution. There he was killed by gas and cremated. This system which deceived the institutions and made them unknowing accomplices, this system which enabled him with very few assistants to exterminate large numbers of people, this system Wirth now employed with a few alterations and improvements for the extermination of Jews. He was also given the assignment by the Fuehrer's Chancellery to exterminate the Jews. Q. The statements which Wirth made to you must have surpassed human imagination. Did you immediately believe Wirth? A. At first Wirth's description seemed completely fantastic to me, but in Lublin I saw one of his camps. It was a camp which collected the property or part of the property of his victims. From the quantity - there were an enormous number of watches piled up - I had to realize that something frightful was going on here. I was shown the valuables. I can say that I never saw so much money at one time, especially foreign money - all kinds of coins, from all over the world. In addition, there were a gold-smelting furnace and really prodigious bars of gold. I also saw that the headquarters from which Wirth directed his operations was very small and inconspicuous. He had only three or four people working there for him. I spoke to them too. I saw and watched his couriers arrive. They actually came from Berlin, Tiergarten Strasse, the Fuehrer's Chancellery, and went back there. I investigated Wirth's mail, and I found in it confirmation of all this. Of course, I could not do or see all this on this first visit. I was there frequently. I pursued Wirth up to his death. Despite some understandable inaccuracies (e.g. the mention of ventilators), in general judge Morgen's account is corroborated by other evidence. 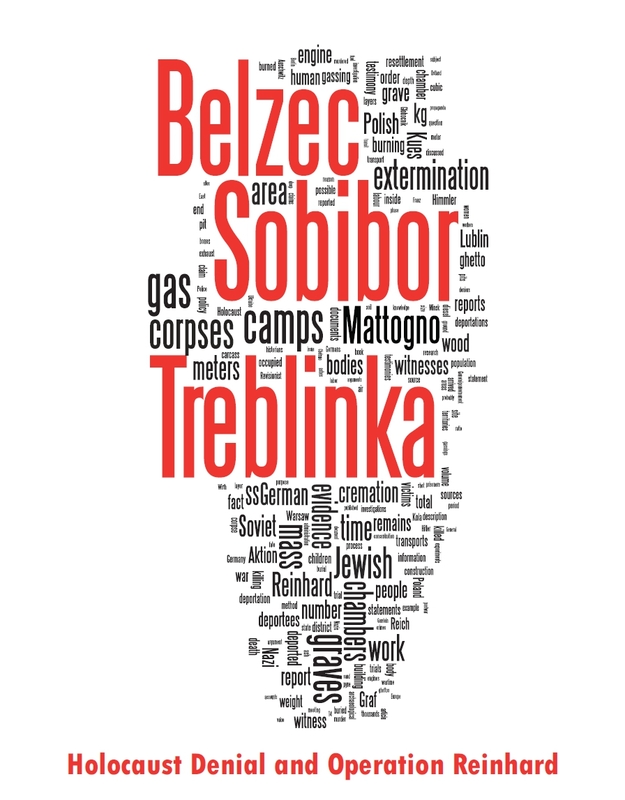 The "four camps" were Aktion Reinhard(t) camps Treblinka, Belzec, Sobibor and Lublin (Majdanek), just as in Hoefle's telegram (they could be said to have been Globocnik's camps, but Globocnik made Wirth an Inspekteur der SS-Sonderkommandos Aktion Reinhard). So why didn't the Ugly Voice mention this testimony? Ignorance or deception? 2) It has already been explained previously why Rajzman's incorrect descriptions of the methods of killing don't discredit him in the least - he wasn't a direct eyewitness. Dr. Horonschitzki likewise had no admittance into the cabins, but of what was known to him, he told me the following: the people were driven in large parties into the cabins of the so-called 'baths.' These cabins were hermetically sealed. In the first period, the killing occurred by means of pumping out the air from the cabins; then one resorted to other methods - poisoning by chlorine gas and Cylon-gas. On the camp territory there was a special store of materials with a large amount (up to 15 tons) of so-called Chloren. Externally, Chloren was constituted of blocks white in color. Every day before my eyes, barrels of this Chloren were carried into the second division. I did not see containers with Cyclon, but rarely and periodically various crates arrived with the transports, which were taken over by the guard staff of the 2nd division without delay. The engines in the 'bath rooms' ran 24 hours without interruption. Whether poisoning by means of gas mist occurred, I have not heard. This only underscores my point - neither Rajzman, nor Dr. Chorazycki had "admittance into the cabins". They made some incorrect conclusions from the incomplete information they had, but that doesn't mean that as eyewitnesses they were unreliable. Rajzman's "gas mist" is probably a reference to steam chambers rumor. Note that Rajzman does not confirm it. Rajzman's mention of the engines, on the other hand, should be interepreted as a reference to the killing with the engine exhaust. I am one of 10-12 persons who survived a Tremblinka [sic] camp no. 2. I worked in the camp from September, 1942 to August, 1943. In the camp there was a secret committee, which more or less registered everything that happened. In these 11 months about 1 million of people were brought in. For work, they had been told. Then they were undressed, suffocated in gas chambers, their corpses were burnt. These unfortunates' property was brought to Germany by train. On August 2, 1943, seizing weapons, some of inmates liquidated the guards consisting of Germans and Vlasovites, set the camp on fire and escaped. During this about 800-900 persons died. 100-200 persons escaped. But in September, before the Red Army advanced, Germans caught and shot almost everybody. Of us 10-12 people survived. I request to create a commission to investigate the activity of the "cultured" German people, and to proclaim around the world that they're such bandits. As you can see, he mentioned only the gas chambers. 3) I won't stop repeating that the Ugly Voice is a gross ignoramus. His ignorance really knows no bounds. Thus, for example, he picks on Rajzman for using the term "oven", because we know that there was no oven in the Treblinka "Lazarett". The oven consisted of an enormous ditch with a concrete foundation and a grate made of rails. Under the grate a strong fire blazed continually, fed by some special fuel. 4) The Ugly Voice whines about the cattle cars, and, as Andrew noted, shows a model of an American cattle car. What a crock! Why doesn't he use the page about the deportation trains from the ARC website? He uses the site in other instances. 5) The Ugly Voice again finds testimonies about hundreds of people packed into small spaces unbelievable. Apparently, he didn't know about Charles Provan's experiment. 6) UV's points about Hoess are rather lame - of course, he simply misremembered the dates and confused the chronology. It has been known for a long time. In fact, there is a whole scholarly article about Hoess inadvertently "shifting" events a year earlier (with other examples cited) - Karin Orth's "Rudolf Höß und die "Endlösung der Judenfrage". Drei Argumente gegen deren Datierung auf den Sommer 1941", in Werkstatt Geschichte, Heft 18, 6 (1997), S. 45-57. 7) Finally, the Ugly Voice is all indignant about the accusations against Nazis who were killing children. Unfortunately for the Ugly Voice, we have documentary evidence of this. When the first truckload [of victims] arrived my hand was slightly trembling when shooting, but one gets used to this. When the tenth load arrived I was already aiming more calmly and shot securely at the many women, children, and infants. Considering that I too have two infants at home, with whom these hordes would do the same, if not ten times worse. The death we gave to them was a nice, quick death compared with the hellish torture of thousands upon thousands in the dungeons of the GPU. Infants were flying in a wide circle through the air and we shot them down still in flight, before they fell into the pit and into the water. Let's get rid of this scum that tossed all of Europe into the war and is still agitating in America. ... I am actually already looking forward, and many say here that after our return home, then it will be the turn of our own Jews. Well, I'm not allowed to tell you enough. SS-Unterscharfuehrer Mueller, who did not belong to the accused's unit, but had his permission to take part in the execution, snatched children from their mothers. Then, holding them in his left hand, he shot them and threw them into the grave. The accused took him to task about this but nevertheless did not stop him. I have yet to see any denier explain these words away. How about denierdudes argument with the dried out christmastree material the "tube" to the treblinka gaschambers was made of and why that didnt catch fire when a stack of 1000 corpses was burning all night just a few meters away? was the tube watered/pissed at by special firefighter slaves all night? please, zionlovers, debunk that one for me. please. > please, zionlovers, debunk that one for me. please. "By means of a special process which Wirth had invented, they were burned in the open air without the use of fuel"
The Nazis had the power to suspend the laws of physics then? Great evidence there Sergey. Of course it's great, despite inaccuracies, as pointed out. Yes Sergey it really is great evidence. I've got to go now; I always fly my pigs when there's a blue moon. Hello whoever from YT i'm talking to. For Uv's argument on the fence, if you you actually took time to read some holocaust books instead of muttering with dumb conspiracie theories, you'd realize that(according to S. willenberg in his book) they used pine branches to camoflauge the fence. There are lots of types of pines, unbeknowest to UV. The germans most likely used the nonflammable pines for the fence and flammable ones for the fires. Try it yourself! Get lots of types of pine braches and try to light them on fire. Some of them actually repell fire, not attract it. Of course, we can't expect our ignorant director to tell us that, so one must do his/her research. Nutzi fruitcake. >"By means of a special process which Wirth had invented, they were burned in the open air >without the use of fuel"
>Yes Sergey it really is great evidence. Certainly so, if you take into account the possibility that what the witness was referring to was the combustion of decomposed corpses taken out of the mass graves, which due to certain factors related to the decomposition process (dehydration and/or the presence of combustible substances like methane or butyric acid) might not have to be doused with fuel but require no more external flammables than the gasoline-doused wood placed underneath the pyre in order to set it on fire. With “fresh” bodies burned right after gassing it was another matter, they surely had to be doused with fuel before they would burn, just like the 6,865 victims of the Dresden air-raid on 13/14 February 1945 burned on the Altmarkt, using the same type of grid structure as was employed at the AR camps. >I've got to go now; I always fly my pigs when there's a blue moon. You sound just like you believed this was possible. Which wouldn’t surprise me, as you apparently also believe in the supernatural, demonic powers of a Jewish or whatever conspiracy that manipulated or suppressed thousands of documents, trained thousands of false incriminating eyewitnesses (apparently chosen for the telepathic capabilities, which would keep them from straying too far from what their colleagues had said even if they had no way of hearing or reading it), coerced or otherwise induced a couple of thousand indicted perpetrators, especially before West German courts, into falsely incriminating themselves, silenced all potential exonerating witnesses throughout Europe and the rest of the world, fooled governments and other administrative authorities, criminal justice authorities and historians and demographers all over the world (unless, of course, you want to tell us that all these people were in the pay of said conspiracy) and brainwashed or otherwise induced millions of non-victims living in Israel, the US and other countries into concealing their origins and identity so it could be claimed that they had been murdered. All without ever leaving behind a single slip or careless word that might hint to its existence and its sinister activities, in more than sixty years after the end of World War II. The first-hand witness, in this case, was the fellow whose account Morgen was reproducing, i.e. Mr. Wirth. The second-hand witness Morgen may have misunderstood that part of Wirth’s account. "Yes Sergey it really is great evidence." Of course it is. What have you done to show otherwise? Picking at inaccuracies is of course what deniers always do, but not all inaccuracies discredit testimonies. Morgen's testimony contains inaccuracies, but not of the kind that would discredit his testimony.